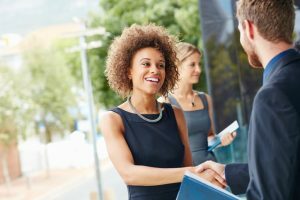 Networking: The joy of extroverts excited about making new connections, and the bane of introverts who find small talk and introductions in crowded rooms pretty painful. Either way, it’s a necessary thing in business. Inc. this week released its list of six things smart people do to have interesting conversations. Six things, in other words, that can make networking more effective and, for those who have a difficult time with it, less intimidating. They’re all pretty simple, too: be interested, smile, give five-minute favors (introduction, knowledge-sharing, etc. ), listen, make the other person feel important, and tell a good story. It all sounds better than “how’s the weather where you live,” doesn’t it? Check out the whole story here and let us know in the comments—what’s your best tip for effective networking?